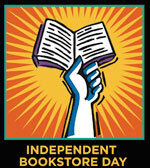 NORTH CONWAY NH – Join the Party on April 28th for the 4th Annual Independent Bookstore Day! White Birch Books will be celebrating all day with lots of great giveaways, morning story time, kids activities, local authors, staff favorites AND more. We will also offer exclusive day-of merchandise created especially for Independent Bookstore Day by major publishers and authors.